Take a bowl, add slices of bread, milk, sugar, cardamom powder and blend it well with a blender. The consistency should be very thick. Take 4 bowls and fill up half of all the bowls with pudding. Keep it in the refrigerator for 2 hours to set. Setting time will vary as per the season and the consistency of pudding. If it is of thin consistency then it will take more time and if it is very thick then it might set in 1 hour also. 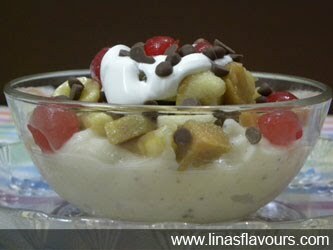 Before serving, add fruits , fresh cream, topped with chocolate chips or grated chocolate. Use can add sugar to fresh cream if you like to have it more sweet.